I’m sharing a recipe that my mom handed down to me. It’s tried and true and the best part? So easy! Yet it tastes delicious and I have yet to meet a person who doesn’t like it. This broiled salmon recipe is my go-to because it’s so good and cooks up in 10 minutes. Plus, you only need 4 ingredients. 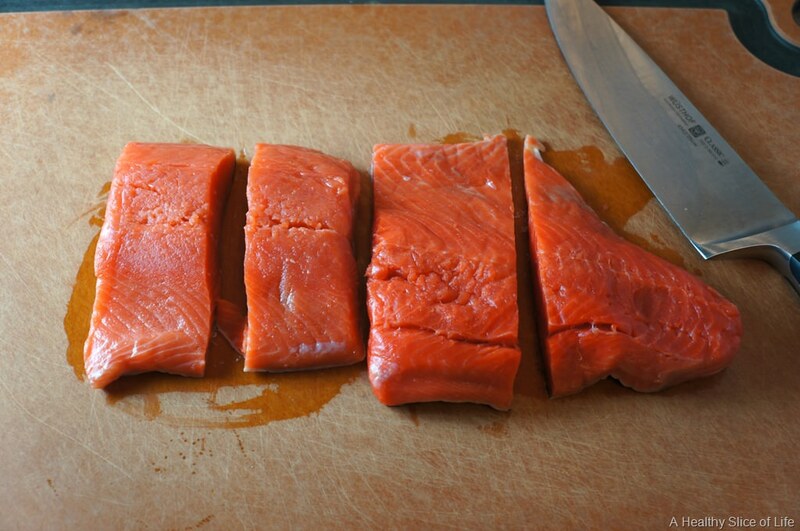 Cut your salmon into portions before marinating, using a sharp knife. 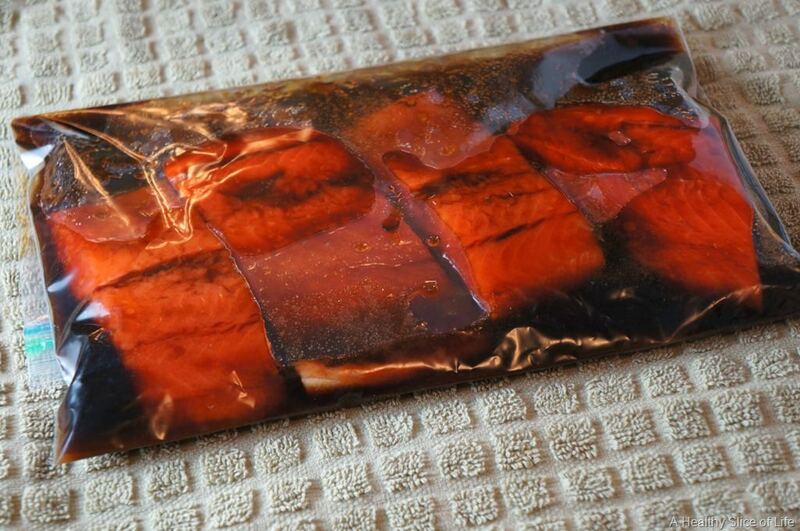 Pour all marinade ingredients into a large, double sealed ziplock bag and mix well. Then, add your salmon. Let marinate in the fridge for 4 hours. When ready to cook, turn the oven on broil and line a large baking dish or rimmed baking sheet with tin foil or parchment paper. 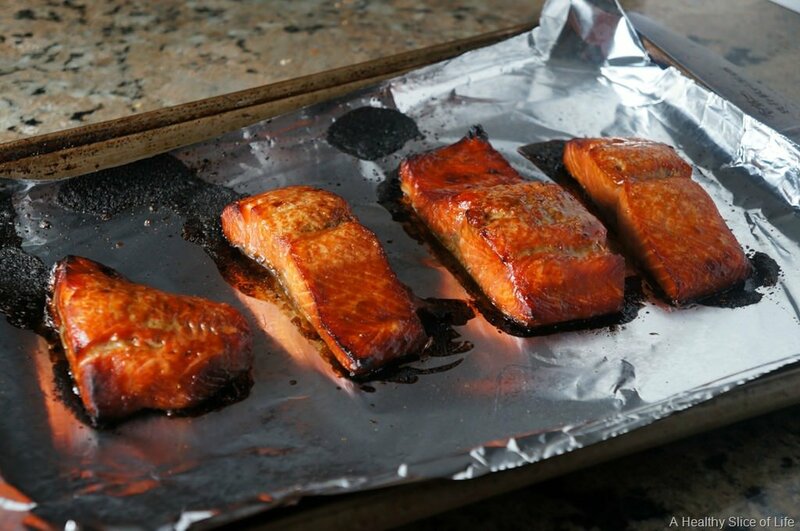 Place salmon on baking sheet and place half way down in the oven. Broil 10-12 minutes, depending on the thickness of the salmon. Let marinate in the fridge for 4 hours. When ready to cook, turn the oven on broil and line a large baking dish or rimmed baking sheet with tin foil or parchment paper. 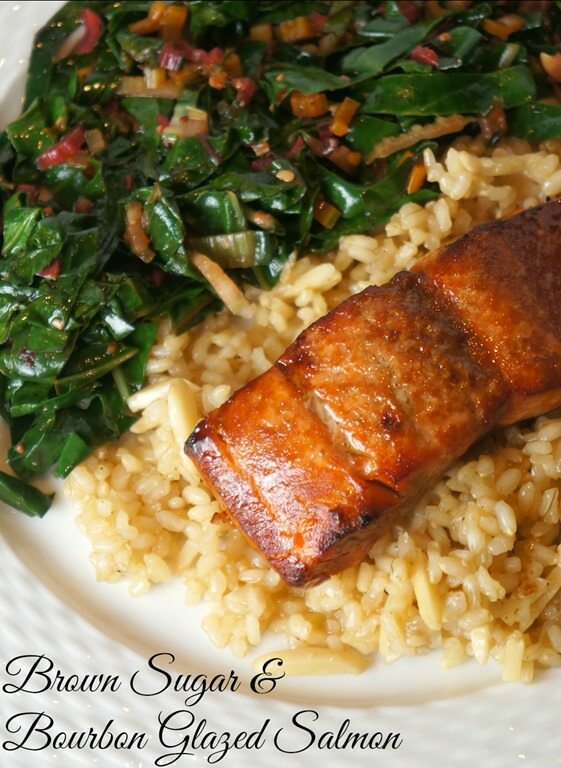 Try this delicious and easy brown sugar and bourbon salmon recipe! This would be a great idea for a romantic Valentine’s Day dinner at home. I served ours over a brown rice and almond pilaf with rainbow chard sautéed with olive oil, garlic and lemon. I always cook an extra piece for the kids to have the next day. They’ll even eat it cold. It’s good stuff! What’s your favorite kind of fish? I love salmon, but also am a huge fan of Chilean Sea Bass. Yet, I’ve never attempted cooking it because I hear it can be tricky and that stuff is expensive! I hope you have a fun time with your mom! Salmon is the best! But I also love Tilapia and….Sardines! Yum! I swear I cannot cook salmon and make it taste decent! I am going to try this! I’ve been dying for an easy, delicious, non-lemony preparation for salmon! you saved the day! Thanks bud! Ok, I have to admit – I’m not a fan of salmon. I know I should like it, but it’s usually too strong a flavor for me. However, your recipe looks so good that I’m going to give it another shot! Enjoy your time with your mom. Yesssss! Thanks for sharing. I cannot wait to make this. Grouper is my favorite fish. Tied for second is amberjack and red snapper. Yes, we are sitting in Birmingham Alabama with schools closed and workplaces delayed. And all it is doing is pouring down rain! I have to go to the grocery store yesterday for a regular weekly trip. And all the milk and bread people were everywhere! Marjorie recently posted..Meal Planning. And Getting More Organized 15 minutes at a Time! This looks great! I have a bourbon smoked sugar from a special spice shop, but thought it could use something else when I’ve cooked with it. 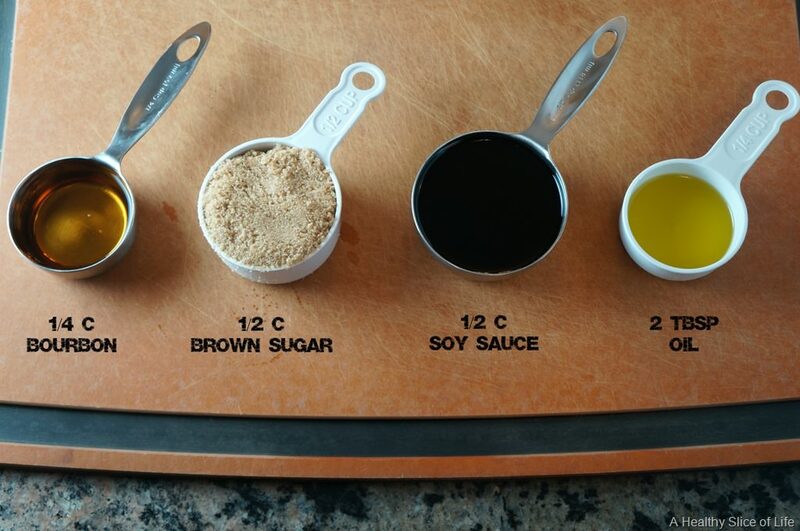 I think soy sauce is perfect! 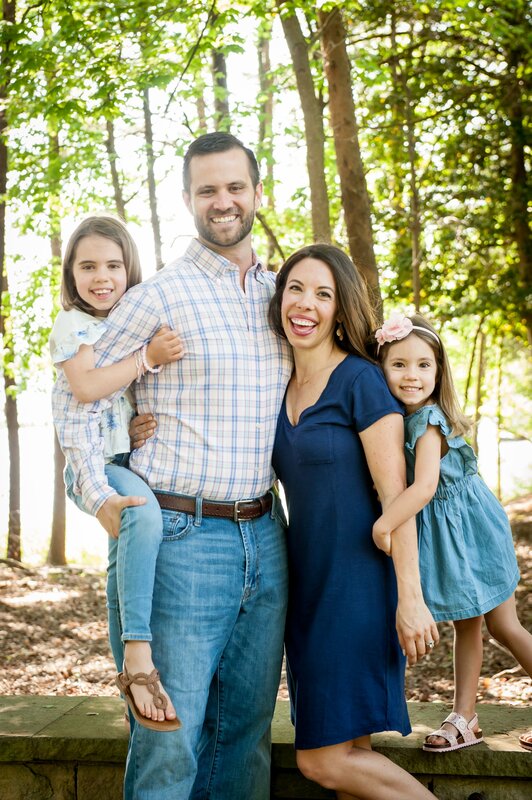 Laura @FitMamaLove recently posted..Just One Friday Fave: An Exciting Announcement! Salmon is my absolute favorite!! However, I always over cook it at home! Must try this!! Enjoy your snow days and your time with your mom! I always crack up at people here when they mention flurries or snow. There is nothing left on the shelves at the grocery! lol! Have so much fun with your mom! This salmon looks delicious!! Salmon is my favorite fish, so I will definitely be trying this! Pinning it right now! you just gave me an excuse to go buy bourbon. wooohoooooo! party with the fish! …as if you ever need an excuse?! Cheers! I love me some salmon! I want this for dinner, NOW! YUM!!! Thanks! We will definitely be trying this at our house. I have declared Monday (President’s Day) as a serious meal planning/prep day that may involve other baby items being checked off the list. I WILL. Have so much fun with your mom! I was just saying to my mom last night at her home for dinner how we don’t have many more just us dates before bambino. I bet you can barely remember those days pre Hailey with your momma! I look forward to reading about your adventures. Fingers crossed snow isn’t too bad (NW is the same 2 inches is a HUGE deal) and hubby won’t have to drive all over. Cheers to a happy and healthy day with or without snow! Good luck on your orange test!!! I’m sure you will do great. I’ve got dinner marinating at home and a walking date after work with a friend and her 7 week old. I’m determined to keep walking without waddling. Yay! YUM! 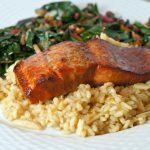 I love salmon – definitely one of my all time favorite fish! I don’t cook much fish, but this sounds delicious! Do you have any good tilapia recipes to share? Oh my, this looks delicious! I absolutely love salmon, but I’m always looking for ways to change it up from our usual salt/pepper/cayenne routine. Pinning now!! Made this for dinner tonight and it was delicious. Even the little one enjoyed it, and she has not been a fan of salmon lately. Thanks for the recipe! Where do you buy your fresh salmon? I find it so expensive most places and then when I try to get it at Sams/Costco it’s farm raised and the only wild caught is frozen and pre-seasoned. Going to try this recipie today. One question do you broil on high? I think so! My oven only has one broil setting- it’s at 500 degrees I believe. Enjoy! 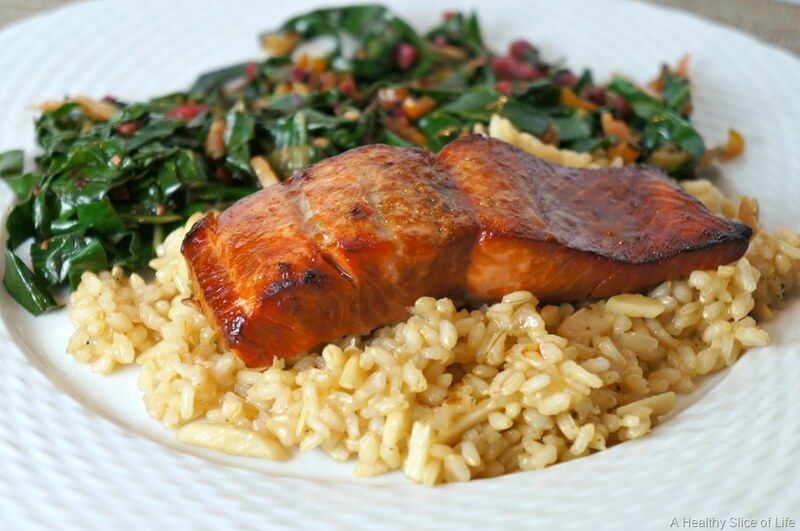 Sauteed swiss chard and an almond and brown rice pilaf! 🙂 No recipes, though- I just winged it.